There was nothing fancy about it or its boulevard Sébastopol location. The café was simple, clean, and typically Parisian, yet more akin to a large neighborhood tabac. Dogs were regulars, visiting often with their owners, but one in particular ruled the roost. The interior was this dog's domain. The ever-alert German shepherd straddling the side doorway owned the place; it was his master's establishment. As laborers and other patrons from neighboring Les Halles and rue St-Denis entered, the large dog immediately perked up, barked, sniffed, and evaluated them as friend or foe. The French paid the pet little mind, while American tourists snapped photographs and spoke stupidly to the animal as if he were a young child. "Chien", as he was aptly named, patiently endured their folly. Few things upset him apart from small prissy dogs eating from their owners' plates. That sometimes made Chien growl. He didn't like sissy dogs; no, he was a pure-blooded shepherd, and French Poodles were not his friends. During my yearly vacations to Paris, I sometimes sat for hours at the café. Its proximity to a main RER and train station at least made it great for people-watching. Locals, tourists, and transients occupied the area. In the restaurant, the servers habitually brought me round, half-melted slabs of cheese atop bread buns when I asked for a grilled cheese sandwich, and I never cared. The strange concoction tasted delicious as I washed it down with big gulps of draft beer, usually Krönenbourg. Downing several large-handled mugs was nothing as I ate, read, and observed life through the glass windows towards the boulevard. In more pensive moods the eastern side bordering the pedestrian walkway was a nice hideaway, as the dog guarded the entrance for me, since I hated missing anyone who might stray inside. Fortunately, amid the sleet and snow of a particularly cold March day, I chose to neglect my hiding place and sit facing the main road. Strolling inside, and passing right of the bar, I found a place in the long and thin exterior room. Among just a couple of others, a French businessman had a corner table, a dark middle-easterner sat captivated by a book, and a retired provincial (it seemed) stood back at the bar just outside the room, with a tired hound at his feet. I knew the old dog and men were okay because Chien had looked them over before napping. Alone in Paris, I was actually becoming weary and jealous of the Parisian lovers present throughout the city. "Poor me," I thought. My relationship was over and even The City Of Light seemed a poor substitute or replacement for a fiancée dearly missed. "But — I'm back in Paris," echoed within my mind. Still, personal psychology was failing. Quickly inhaling the food, thinking and drinking became my tasks. I reminisced. I drank. I planned. I drank more.... Suddenly and unexpectedly a lovely young woman strolled past the plate glass windows of the café. My eyes followed her every move. After staring at the posted menu, the woman moved out of sight. I hoped like Heaven that she had entered the café. A gentle bark lifted my spirits..... She had. I remained almost calm as the neatest of women strode through the room to the small table just behind me. Eavesdropping on the conversation with the waiter, I understood the fresh-faced lady to be courteous and friendly, although my French ear was poor. As minutes passed, my impulses took control. Unable to resist her voice or it's pleasant tone, I deliberately broke one of the ten commandments of tourism. I made it obvious that I was an American in Paris. Her light brown hair, black corduroy jacket, and suede walking boots teamed with various mannerisms to indicate that she may not be French. This gave me license to look around often and bring attention upon myself through my own "Americanized mannerisms," and loud conversations with our waiter. The risk paid-off.... The well-mannered and self-composed female smiled during some of my antics and said hello. "Hi," I responded. Turning around for various reasons, none of which were necessary, we often made eye-contact. Forget the European taboo, I was not being rude, and the woman asked me to join her! Years of carousing had taught me many things, one being to downplay matters to relax tension and pressure. Purposely leaving my bag of souvenirs at the table, I walked over with a drink in one hand and a camera in the other. No big deal. If worst came to worst, this would be a quick visit with a fellow patron. In my mind, I ruled out French as her nationality. No true French accent accentuated this girl's English. She was definitely European, but from where? We began to talk like good friends. After covering the weather, Parisians, and the two dogs in the nice café, the topic finally turned to ourselves. The best translation of her twelve letter first name amounted to "Mary-Ann." Indeed, she was Dutch. En route from a holiday in the south of France, this was a brief layover between trains. Mary-Ann was bound for Holland, home, and ecological engineering school. In America we might say that she was on "Spring Break," which had been extended by her choice. I ordered another bière while Mary-Ann worked on a sandwich plate and a soft drink. We got along well. Very well. She was a dream. All things run their course, including time. Before either of us realized it, almost two hours had passed. She checked her watch and became frantic. The train would leave in a matter of minutes. I took her tab and she hurriedly gathered her things. Following a nice goodbye, Mary-Ann was out of the café, and out of my life. She ran amid the sleet flagging a taxi. My only recourse was to take a final photograph from afar. It dawned on me that in the midst of it all we had failed to exchange any type of contact information. 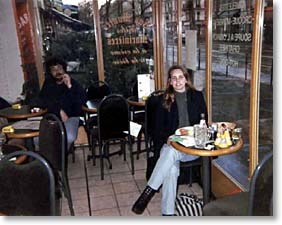 A couple of photos inside the café and one of her "erratic taxi-cab chasing" were all that remained. I honestly blew it; I was a disgrace to manhood, the whole gender in general. Copyright © 2002 Jimmy Hall — All Rights Reserved. Image sources: Photo of a nice café in Paris - provided by Jimmy Hall. Copyright 2002 – All Rights Reserved. Browse our selection of over 200 art and photographic prints — featuring charming renditions of French bistros, cafés and shops — by such artists as Dennis Barloga, Guy Buffet, André Deymonaz, George Ferris, Didier Lourenco, André Renoux, Robert Schaar, Viktor Shvaiko, Vincent van Gogh, and many more. Once patronized by such literati as Samuel Beckett, Jean-Paul Sartre and Ernest Hemingway, Les Deux Magots has been a cherished haunt for artists and writers since it opened in 1885. Open daily from 7:30 a.m. to 1:30 a.m. Address: 6, place Saint-Germain-des-Prés, 75006 Paris ; Phone: 01.45.48.55.25 ; E-mail: cmathivat@free.fr ; Métro: Saint-Germain-des-Prés. CNN reporter Jenna Milly explores the cultural changes in France — a widespread decline in the consumption of wine, the government's campaign against alcoholism, and a proliferation of fast food joints — which have prompted many cafés to close their doors. The years following World War I saw an influx of American expatriates into Paris, notably aspiring writers like Ernest Hemingway, and those who had already made their literary mark at home — such as F. Scott Fitzgerald. Trace the evolution of this literary community, including Gertrude Stein's salon and its celebrated guests, plus the transatlantic review, Sylvia Beach's Shakespeare & Co., the "Lost Generation", and much more. If you fancy yourself exploring Paris from a base in the Latin Quarter, just like your favorite expat authors, there are a handful of excellent first-class (3-star), and two luxury (4-star) hotels to choose from, as well as an apartment-hotel at Citadines Saint-Germain-des-Prés (204 studios &/or 1-BR apts. with kitchens). The well-traveled Brit, Michael Palin (formerly of Monty Python fame), documents some suggested Métro routes and neighborhood walks — in his inimitable, humorous narrative style — which more or less retrace Hemingway's haunts of yore. In which café did Robespierre play chess? Where was Napoleon forced to leave his hat in lieu of payment when he forgot his purse? In what establishment did Simone de Beauvoir find respite from loneliness after Sartre left for the Front? The Cafés of Paris ... a Guide provides much more than the encyclopedic listing of establishments one might expect. Nominate A Site — Submit An Article!